These chunky flash cards feature all 50 states paired with their landmarks and iconic associations. From the capital of Maine to California redwoods, the kids will love learning about the USA from coast to coast. 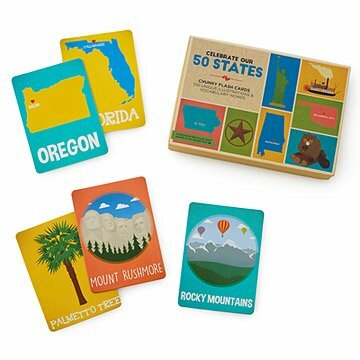 This set of chunky flash cards features all 50 states on one side and landmarks, natural features, and other iconic associations on the other. Great for fostering vocabulary, reading skills, and geography knowledge, their colorful illustrations will please parents and children alike. They're designed for toddlers just identifying colors and new vocabulary, as well as for older kids learning their states and capitals. Made in China with 30% recycled gray board and soy-based inks. Clean with damp cloth if needed. This product is great quality! The cards have beautiful colors and they are thick. I also like that it came with a nice box.